Abstract: In this episode, Karin discusses how artists create, and take from life and experiences. What we perceive as ‘new’ and ‘authentic’, and how this has been looked at through history till today. Merx, Karin. 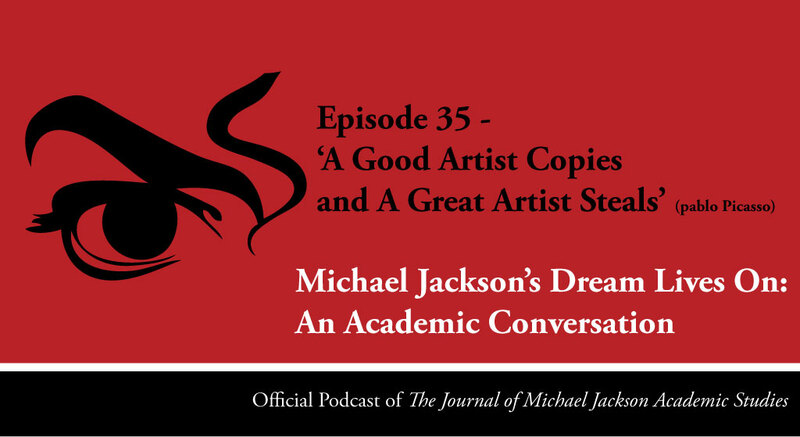 “Episode 35 – ‘A Good Artist Copies, and A Great Artist Steals’ ” Michael Jackson’s Dream Lives On: An Academic Conversation 5, no. 3 (2018). Published electronically 06/03/18. http://michaeljacksonstudies.org/episode-35/. 1. Quote by Pablo Picasso. 2. Plato, The Republic, (Penguin Classic). 3. Aristoteles, Poetics, (Penguin Classic). 4. David Myernik, The Challenge of Emulation in Art and Architecture: Between Imitation and Invention (Ashgate Studies in Architecture). 5. Elizabeth Amisu, The Dangerous Philosophies of Michael Jackson: His Music, His Persona, and His Atistic Afterlife (Preager, 2016). Great history lesson in this podcast; I really appreciated the perspective you gave to the question of authenticity in art.